I know some people think we shouldn’t scare children and shouldn’t make them think all strangers are bad. I know that such abductions are rare and fail in comparison to other violent crimes against children. But you know what? They do happen, and they do take innocent lives. I also think there is a difference between scaring children needlessly and teaching them to recognize dangerous behavior, and equipping them with important information that could potentially help save their life. I am trying to introduce the concept to my 3 y/o by mentioning some things when we are out in public: explaining that sometimes mommy might not be there when something happens, and whom she could approach for help, or what she should NOT do if asked by someone she doesn’t know, or even someone she thinks she knows. Or what to do if she gets lost in a store. Things like that. I am planning to keep adding relevant information as she gets older, not to overwhelm her all at once with a scary concept and too much complicated advice. Because it is better to be safe than sorry. And it is better to know I have tried to give her the tools to protect herself if I am not around. Now, let’s hope it never happens to you or anyone you know, of course. “Remember that carnivals, fairs, public restrooms, and malls are the most common places where abductions occur. Always go with your child to the restroom when in a public place. Establish a family password and make sure the children know that no one will ever come to pick them up in your place without knowing the password. Teach children that they have rights, even the right to say “No!” to adults in certain situations…including adults who want to do something that makes the child feel funny or uncomfortable or those who want the child to go somewhere with them that hasn’t been approved by their parents. Admit to your child when you are wrong about something. This shows your child that adults are not always right. Be sure your children understand what a stranger is and realizes that is it almost impossible to tell by appearances which strangers may try to hurt them. Teach them that they are never to get in cars with strangers or accept gifts from them. Potential abductors often ask children to do favors for them. Tell your child that no matter what a person says, the child should never go with anyone unless you have given the child permission, or the person gives the correct code word. Teach children to stay at least two arms’ lengths away from a person, or a person’s car, that they are unsure of. Tell them to never lean into a stranger’s car window, for any reason. Practice with children what they should do if they get separated from you in a store or a crowd. Tell children to go to a sales clerk or checkout counter to get help…do not wander around the store or go out into the parking lot. Be sure that your child’s school or day care provider knows who is allowed to pick up your child and that they are not to release the child to anyone else. Keep records on your child which include their fingerprints, blood type, lock of hair, recent picture, (children under 2 years of age should have a picture taken every three months), and dental records. FINGERPRINTS MUST BE TAKEN BY A PROFESSIONAL IN THE FIELD OR THEY WILL DO YOU NO GOOD. Be sure your child does not wear any clothing item which has his name printed on it, since this makes it easier for a stranger to convince your child he is a friend. Instruct children not to answer the door when they are home alone but to go to the phone, be ready to dial “911,” and turn on a television or stereo to make noise if someone tries to break in. Teach them not to tell people on the phone that they are home alone. Show your child the homes and shops in your neighborhood that are safe places to seek help in case of danger. Make sure your children know their full names, phone numbers (including area code), how to dial an operator, and their full addresses (including the state). If you are divorced or separated, be sure that you have legal documents stating the custody situation. Be sure you know your separated partner’s address, car make and license number. Assure your children ever chance you get that you love and care about them. Urge your local school to conduct safety programs. Meet with mall and store managers to arrange that store doors would be immediately closed and locked if a child is reported missing. Before I go anywhere, I check first with my parents or the person in charge. I will tell them where I am going, how I will get there, who will be going with me, and when I’ll be back. I check first for permission from my parents before getting into a car or leaving with anyone – even someone I know. I check first before changing plans or accepting money, gifts, or medicine without my parents knowledge. 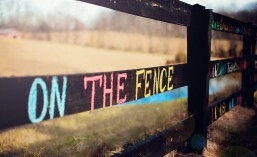 I say “NO” if someone tries to touch me in ways that make me feel frightened, uncomfortable, or confused. Then I go and tell a grown-up I trust what happened. I know it is not my fault if someone touches me in a way that is not okay. I don’t have to keep secrets about those touches. • Say “NO”, get away, tell someone. Teach children to yell from their diaphragm, not scream, if they need help. Yelling is distinct and easily identified from the typical high-pitched screaming children do as they play. Practice with them so they will feel comfortable yelling if anyone tries to take them away. If someone grabs your child from behind and tries to cover their mouth, teach him/her to grab the abductor’s little finger and pull it as far back as they can, while yelling for help. Teach children that they should try anything possible to keep an abductor from taking them away to a secluded area. Even if the abductor has a weapon, he/she is much less likely to hurt the child in public. The child’s chances of serious injury and death are multiplied if the abductor is able to get them to a secluded area. Teach children that they can be strong! They should always fight if someone tries to grab them. Teach them to stomp their heel on the abductor’s instep, scrape his/her shin with their heel, poke their fingers in the abductor’s eyes, use house keys, pencils, or anything else they may have as weapons. 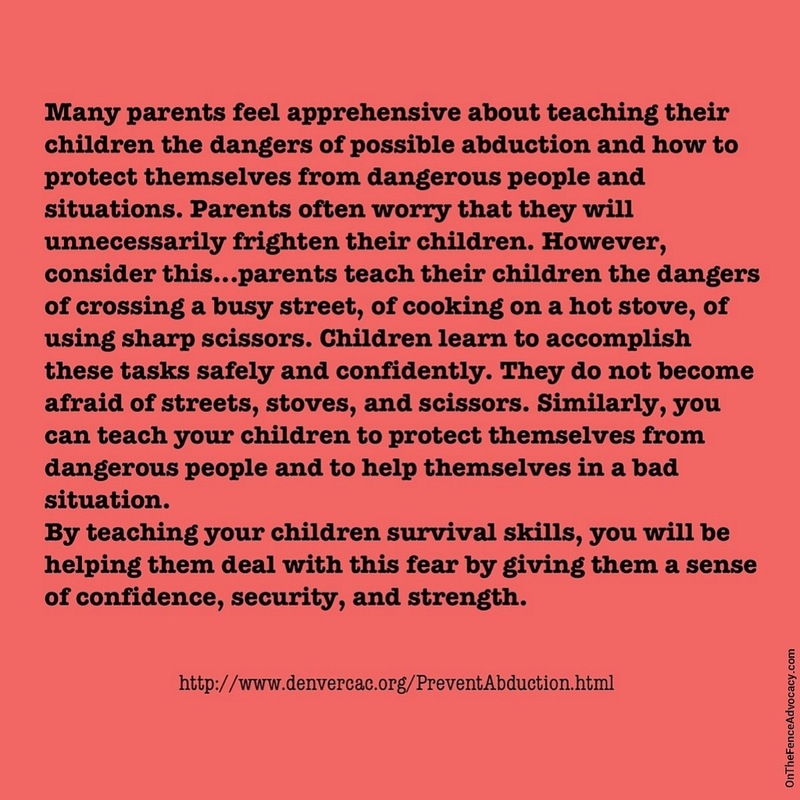 This entry was posted in What Parents Should Know and tagged Abuse prevention, Parenting. Bookmark the permalink.